The country positioned itself for the third time as one of the 18 producers of the best cocoas in the world at the “Salon du Chocolat 2017 world event held in Paris. “Bolivian cocoa competed with 166 samples from 40 countries from all the producing regions of the world, in a first instance they were evaluated in presentations of liquor and un-tempered chocolate, the sample COE-BO-003 (Chocolecos) was classified among the 50 Best samples of the World Tournament, then, in the months of August to October, a panel of 41 international experts evaluated these 50 samples, distinguishing Chocolecos as one of the best cocoas in the world,” said a note from the Foreign Ministry. The sample belongs to the Association of Cocoa Producers of the Leco Larecaja – Chocolecos Town that belongs to the Municipality of Guanay. This was obtained from Amazonian wild cacao trees, under traditional-ecological harvesting practices and with agroforestry production systems. In 2013, the cocoa of the Central Cooperatives El Ceibo obtained similar distinction and, in the year 2015, the samples presented by the Wild Cacao Producers Association of Carmen del Emero (Aprocace) del Madidi – La Paz and the Association of Producers Agroforestry of the Bolivian Amazon (Aparab) of Riberalta – Beni, also received this award. 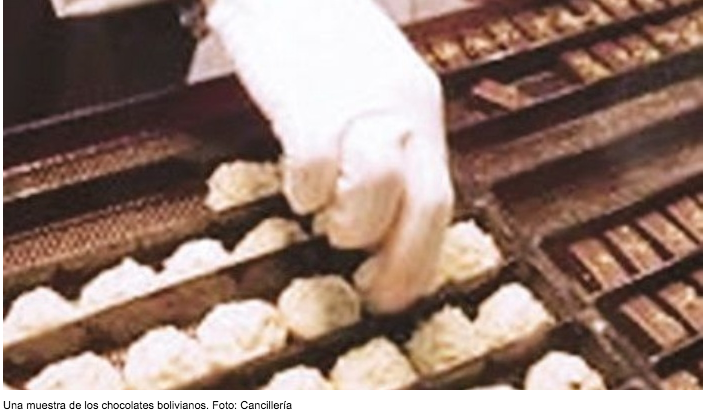 “The Vice Ministry of Foreign Trade and Integration permanently supports the promotion of Bolivian products with world-class quality and the search for the best markets for the exceptional cocoa beans in Bolivia,” the note states. Bolivian Thoughts opinion: Undeniably, Bolivia is a mega diverse country, according to international standards, this news only confirm our fortune. We must preserve this quality and be very careful when illegal settlers flood our forests, when they start the slush and burning or when this populist government intends to build dams in this precious region. The world need to know that this cacao is only possible if we preserve our environment!